The health and beauty of a smile are both valuable goals for a patient to have, and the treatment that enhances its aesthetic qualities often also improves its vitality. Dr. Philip Kress provides cosmetic dentistry in Cerritos, Artesia, La Palma, and the surrounding communities in order to help patients achieve these objectives. A common aspect patients look to improve when developing their ideal smile is the brightness of their smile. 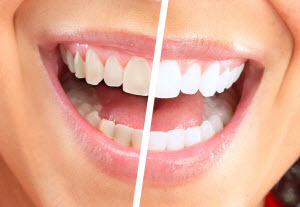 Whiter teeth tend to be seen as more beautiful as they give off a vibrant, healthy appearance. Our dental practice in Cerritos offers teeth whitening to help his patients develop their ideal smiles. We use the Rembrandt® system, a take-home option that our patient conduct within their daily schedule, allowing for convenience as well as great control over the end result. Our dentist takes impressions to create the custom whitening trays used as part of this system. Not only do these fit your smile comfortably, they also ensure the whitening agent take full effect, encouraging the most beneficial outcome from treatment. Each of these provide unique benefits when used to restore your smile, which our Cerritos dentist can review with you during a consultation visit, along with the recommendation that best accommodates your needs. Traditionally, these restorations can be made from various metals, which offer resiliency but are easily noticed. Our dentist can provide porcelain restorations as an option for restructuring your teeth. Porcelain is durable enough to preserve functional integrity, while also mimicking the color and texture of naturally healthy teeth. Additionally, we also offer porcelain veneers, which reshape and brighten individual teeth for a more uniform smile. In order to restore teeth with cavities and maintain the smile's aesthetic appeal, our dentist provides fillings made of composite resin. Our dentist values this tooth-colored material for its ability to match the shade of genuine enamel. For most patients, composite fillings possess the strength and restorative capabilities their tooth needs while blending seamlessly into the smile. Philip I. Kress DMD, Family Dentistry provides various cosmetic options in Cerritos, helping patients from the surrounding areas obtain the attractive smiles they want. To find out which of these will best serve your needs, call our practice today to schedule your next appointment.